I had the pleasure of discussing analog gaming and design over dinner with veteran Japanese game designer Yoshiyuki Arai. Among his various accomplishments, his game Fantasy Defense had a very successful Kickstarter. Scott: How did you get started gaming and what were your first games? (Japanese blog post about the SD Gundam version) board game series took off, with each game costing 1,000 yen each. I couldn’t afford it with my allowance, so I’d play at a friend’s place. They included an A4 size board, rubber figures, and dice. Over ten years there were over 300 types of games and it was a big hit at the time. A long time ago, Japan was a major player in the board game market. Sorry, I’m starting with some board game history. Avalon Hill games were imported and sold in department stores. I never played them, but gamers born before the 70’s most likely have. In fact, I’d say that most gamers now in their 50’s got started with Avalon Hill games. While I enjoyed Party Joy, the Famicom (NES) came out in 1983 and I stopped playing board games. The board game market definitely decreased during that time. Scott: Going back to your Famicom days for a second, what types of games did you play? Arai: I was big on Dragon Quest (Dragon Warrior in America) in elementary school, but of course also played Mario and action games. Video games were actually banned at my house, so I had to play at a friend’s place. I’d say I was definitely into Dragon Quest the most and it influenced my interest in RPGs. So in the mid-nineties, German games started coming out and being imported. Shops selling RPG games started to carry them as well. The Japanese version of Magic: The Gathering also came out in 1996, although the English version was already being played in Tokyo prior to that. Little by little, board games increased in popularity and RPG magazines also began promoting them. The college RPG club had a big influence on me. It consisted of about twenty people at its height. As an aside, circles (サークル ) are a group people who work together to produce a product like manga or games. While it sounds weird, there's also an "individual circle" (個人サークル), which is a circle of one person. I'm actually classified as an individual circle. Scott: How long have you been making games and which was your first? Arai: I made my first game in 2001 as part of a contest run by FarEast Amusement Research, now called FEAR. My game Pyramid Pyramid won and was published. The game consisted of building a pyramid with wooden blocks. You’d roll the dice to determine how many blocks you could use. After Pyramid Pyramid, I continued to make additional games. In 2010, my game Flying Cheese was picked up by a Korean publisher and had releases in Germany, Korea, and Japan. Scott: How many games have you released so far? Arai: I’ve released seven games through publishers and ten independently for a total of seventeen games. Although I’m a professional game designer, I also make independent releases. Going with a publisher takes a long time, I’d say one to two years, before your product sees release. By independently publishing my games first, I can make a game in two to three months. Tokyo Game Market, which happens twice a year, is built around this general scheduling of how long it takes for independent designers to release games. Speaking of which, fan fiction (同人) works have a long history in Japan. While they can be original content, they can also be derivative content. They make up a huge part of the market, something like a billion yen. Publishers stay quiet on this issue, partly because it helps promote their own works. It’s a cultural phenomenon that doesn’t really seem to be present in America or Europe. As long as the amount sold remains fairly low, no one bats an eye. There are a lot of small, often family run, print shops in Japan. With the boom in board and card games, many of them have started offering card printing. Digital publishing also makes a difference. It used to be offset printing, which was quite expensive. Print on demand has really changed things and enabled small print runs (even just ten items, but it’s expensive). Thanks to this there are now 300 circles that exhibit at Tokyo Game Market. Designing games is a hobby for many people, so profit is often not a concern and they’re ok with only selling a few. As a professional, though, I approach it a bit differently and want to expand the reach of my games and also provide a high quality product. I also don’t want to spend time approaching a publisher with just an idea or prototype. Instead, I make a finished product and sell it on my own. I then approach a publish with the finished game and we work out a contract. Once that is done, they handle all production and distribution and I get royalties for the games that they sell. Scott: Has how you approach making games changed? Arai: Test play has definitely changed. Before, I’d join in with the testers as a player. Now, I objectively watch the testers play the game without actually participating. Scott: How many times do you usually play test with others? Scott: Can you walk us through the process you use for designing games? How do you start? Arai: Sometimes I start with the system and other times with a theme, but I’d say I start with the system more often than a theme. I’m an engineer, so I like systems. I’ll think of a system and then think of a theme that suits the system. Make a prototype; play test; balance; and then create the final game. Scott: How do you balance a game? Arai: I’m scientific by nature, so I use probability calculations and enjoy a methodological approach to it. Most games have a randomizer of some sort, with each game balancing randomness with player skill. I primarily start by applying probability theory and then on top of that add strategy. I’ve been doing this for a long time, so I’d say I’ve gotten better at intuiting mechanics and also finding things. Scott: How do you find your inspiration? Arai: Ideas come while relaxing and not thinking of anything. Scott: Which of your games is your favorite and why? Arai: Flying Cheese. It was my first published game that I completely developed on my own accord and approached a publisher myself. It’s also my best-selling game to date. Scott: Are there any differences between Japanese and non-Japanese designed games? Arai: Japanese games from publishers tend to be family oriented and very simple. The game Life (人生ゲーム) happens to be the best-selling game in Japan. Fifty years after it was published by TakaraTomi it’s still making over 3,000,000 Yen per year. Another popular game is a baseball game called Yakyuuban (野球盤) that was first released in 1958 and continues to evolve. The ball used to just roll along the board, but now it actually flies through the air and they’ve added led lights and sounds to it over the years. There’s of course also games like Monopoly. Now, Euro games are influencing Japanese publishers. Japanese games tend to be short party games. Word games, like Shiritori and Scrabble-like games are also popular and are targeted to help kids study. Games actually have a bit of a negative image, and there’s a bit of a rejection of them. You can’t study if you play board games too much. After that, it was comics. Scott: And the Famicom as well, I imagine. Arai: Yeah, games have a bit of a bad image, so I respect educational games. Their influence seems to be increasing. Recently, probably about five years ago, games as a means of improving and teaching human interaction have increased. Also, the 2011 earthquake and power shortage also saw an increase in non-electronic games. Japanese people tend to be shy, so games can be a tool that enables them to converse. Most traditional Japanese games, such as Shogi and Go are played without a word. That is normal; it shows that you’re playing in earnest. If you speak, it’s seen as you’re not concentrating on the game itself. You’re doing two things– playing and speaking, so it’s like you’re bluffing. There’s actually a term for that 口三味線を弾く– literally imitating the sound of a shamisen, a stringed instrument, with your mouth. While used outside of Mahjong, it seems to have a correlation to it, where verbal bluffing is bad manners. “Lies are the beginnings of a thief” (”嘘つきは泥棒の始まり”) is a proverb that you hear as well. There are actually people who refuse to play bluffing games, and Japanese poker players probably don’t verbally bluff, though they do so with their wagers. This is different from the religious outcry of D&D in the 80’s and is part of the [Japanese] culture. Actually, maybe there is a Buddhist influence that has entered Japanese culture. Enma, the lord of hell, judges the dead and decides their fates. There is a mirror he uses that shows the truth, and he takes the tongue of liars. Even when gaming, lying is bad. On the other hand, Euro games tend to be played with the family and traditionally involve communication. The cold winters prevented people from going outside, so they’d gather in the living room in front of the fireplace and play cards. Scott: You went to GenCon for the first time this year. What was it like? Arai: GenCon – 24 hour gaming. It was crazy, with gaming in the hotel lobby until the morning for four days. A geek festival spilling out into the surrounding town like a football game. Scott: You exhibit at a lot of Japanese game and comic conventions. Are there differences between those and GenCon? Arai: GenCon – geek only, no family. I thought it was only geeks. Spiel – there are a lot of families and some geeks. Five years ago it was primarily geeks. Game Market – it used to just be geeks, but now it’s families, too. Kusaba Jun started the Game Market in 2000 as an individual, but it continued to grow and become to much for an individual endeavor, so the company ArcLight took over and it continues to grow. Scott: You had a very successful kickstarter. What was that process like? How did you meet the publisher Sweet Lemon? First of all, I really like Sangokushi (the Three Kingdoms period of Chinese history). 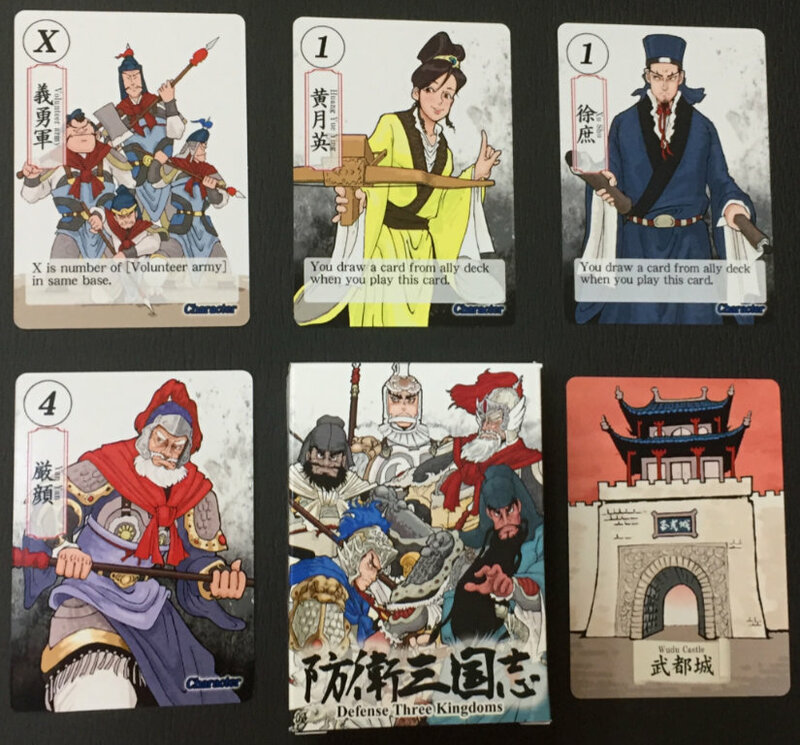 I made the card game Defense Three Kingdoms as an indie designer and took that game to a Korean game company. Korea, Taiwan, China, and Japan know the history of the Three Kingdoms, but outside of Asia there’s not much knowledge. The game is single player, so I made it difficult to win, but the publisher said it was too hard and wouldn’t sell. 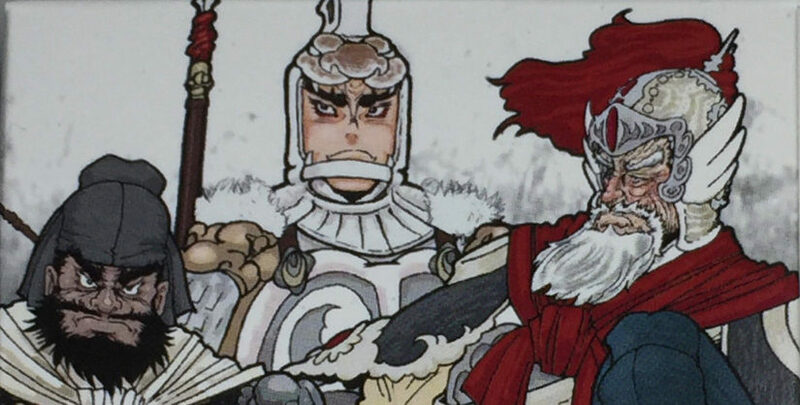 The company Mandoo Games likes the Record of the Three Kingdoms and wanted to publish it, so they brought in Sweet Lemon and published it on Kickstarter. The Three Kingdoms is unknown outside of Asia, so we decided to reskin it as fantasy to appeal to an international audience. The system remains mainly the same, but the publisher has done some additional balancing and it’s a bit simpler to win than the original version. Scott: Any advice for new game designers? Arai: Same as any creative endeavor, you should have many interests. Travel, movies, books− they all lead to ideas. If I was not a fan of the Three Kingdoms and had not studied it, I’d never have made the game and it’d never have been picked up and published in Korea. If I only played games, I probably wouldn’t have made games. After that, being able to speak English (or a foreign language if you’re a native English speaker). As an example, for games aimed at Japan. That is, if you want to sell them in Japan, it is advantageous to know the Japanese language and culture. It is an advantage to know the culture. In reality, there are a number of Korean and Taiwanese making games and selling them in Japan. The similar Asian cultures, and having played games exported from Japan, give them an advantage. So my advice is to have lots of interests. I’m glad to have so many interests. If I only played games, I probably wouldn’t have made games. Scott: How are American and European games received in Japan? 2. If nothing else, Japan is appreciative of foreign-made goods. American and European products are perceived to have a high quality, which makes them highly desirable. Scott: Any new games we can look forward to? 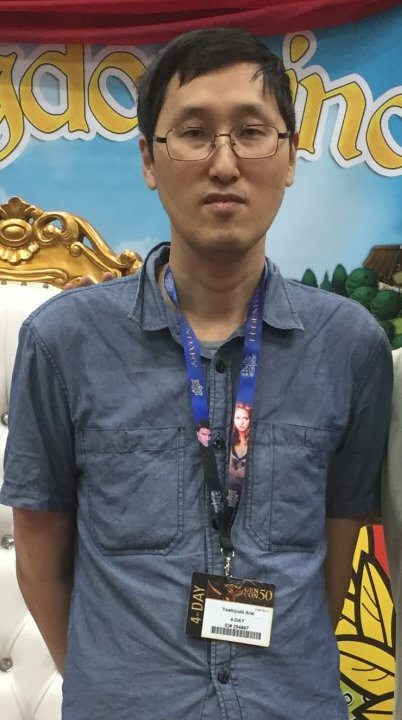 Arai: I hope to publish a new game with Korean Publisher. Speed Clay Maker sometime next year. Arai: I’ll be selling Speed Clay Maker and Fantasy Defense at the Mandoo Games booth (booth number C010) at the Tokyo Game Market this December 2nd and 3rd. There are English rules and you’ll be able to play them there. A big, big thank you to Yoshiyuki Arai for taking the time to talk with me. You can find out more about him on BoardGameGeek as well as his Twitter.